So, you want a pet fox? Here's what you need to know. Foxes raised to be pets are what is referred to as tame. They are not domesticated animals like a dog or cat. The difference is that domestic dogs have been living with and adapting to people for around 30,000 years while your fox's ancestors may have only been kept as pets for something like 30 or 50 years. Responsible breeders raising foxes for pets have selectively bred only the most tame foxes in controlled environments for many generations and hand raised and socialized the kits (babies). This makes them tame but they still retain many of their wild instincts. These natural instincts in foxes can potentially lead to some very destructive and undesirable behavior. They chew, climb, jump, dig, steal, and many species have a strong odor which they use to mark their territory. To sum it up, if you choose to get a fox as a pet he is unlikely to adapt to your lifestyle. You will have to adapt to his. The following information is about general fox care. Be sure to also check out the species specific links on this page because requirements vary greatly with an animal that can range from a 3 pound fennec to a 15 pound red fox. housing Very young kits should always be kept in an indoor enclosure when not closely supervised. Most species are small enough at this point to squeeze through the holes in many types of fencing. The general rule of thumb is if the animal can fit its head through, assume it can squeeze its body through. Also, being outdoors alone can be scary for a tiny fox cub and you would miss out on critical bonding opportunities. The indoor kennel should have some type of bed or box for him to hide in. A litter box is also a good idea. When loose indoors, you must make sure your fox is watched very closely. Put breakables and anything valuable (including your car keys) away, keep electrical cords out of reach, and consider using child locks or rubber bands on cabinet doors. If keeping your fox indoors through adulthood you should crate train, limit access to a specific fox-safe room, or ideally have an outdoor pen (secured with a top and bottom) to keep your fox in when you are unable to watch him or her. Foxes love to be outdoors and should have that opportunity often. Provide different smells and textures outdoors, such as wood, sand, dirt, rocks, gravel, and hay. They don't have to all be in the pen at the same time. Introducing new items periodically will help keep your fox entertained. Try to keep their outdoor enclosure similar to what their natural habitat would be in the wild. Housebreaking is best accomplished by using a litter box. The size and type of box will depend on the species you have. Use a very thin layer of litter; I prefer Critter Care small animal bedding or a similar product. You could also use non-clumping cat litter, dog litter, or newspaper pellets. Foxes don't bury their waste, so there's no need to use too much litter. You could even simply line the box with old newspaper, but that doesn't do much for reducing odor. Some foxes are much more difficult to housebreak than others. Some never do learn completely. When dealing with a stubborn fox or very young kit you may try putting several litter boxes throughout the areas of the house he's allowed to roam to increase your chance for success. Be sure to check the species links below for outdoor housing and enclosure information for your specific fox. feeding Feeding your fox is relatively easy. The primary source of his food should be a good quality dog food (meat should be the first ingredient). Kits should be started on puppy food. As he or she reaches around a year of age, you can slowly switch to adult dog food, leave it on puppy, or a feed a combination of the two depending on activity level. If your fox starts getting chunky, gradually reduce the amount of puppy food and increase the amount of adult food. Or to keep things simple, I feed a formula of food intended for all life stages to all my foxes. Some people have discussed using cat or kitten food, but as foxes are omnivores like dogs, the protein ratio in cat food can be too much for foxes as their main diet. But for an occasional treat it does just fine. There are commercially prepared canid foods available but these can be quite expensive, especially for larger foxes. Instead, you should supplement your fox's food a few times a week with a variety of veggies, eggs, meat*, and fruit (don't overfeed fruit because of the sugar content). Different species as well as individuals will prefer different foods. Cooking the meat is ideal and seems to cut down some on foxy odor. Some people choose to give raw meat to their foxes for a more natural diet. This does carry an increased risk of your fox getting sick from tainted food, so use caution if you choose to feed raw. *I mean real meat such as chicken, turkey, fish, and once in awhile red meats like venison or beef; not bologna or other overly processed mystery meat. Do not give foxes pork or pork based products or treats. In addition to pork, chocolate, raisins, grapes, onions, avocados, caffeine, and alcohol are also off limits. If in doubt as to whether a food is safe for your pet, don't feed it. If it is not safe for dogs, don't feed it to foxes. It's also not a good idea to feed road kill or mice due to the diseases they can carry. All foxes love treats! Especially sugary treats. Many strangely go crazy for marshmallows and coffee so keep these out of their reach. If you choose to give a rare marshmallow treat, make sure you brush his teeth because sugar will decay a fox's teeth just like it does ours. Please don't feed caffeine. Occasional treats of carrot pieces are beneficial in aiding digestion. 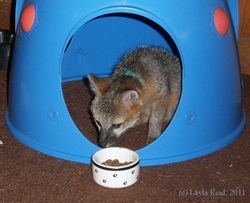 behavior/handling The first 6 months of your fox's life are the most important for socialization. Pick up and handle your kit as much as possible, even if just for a few minutes at a time. Get him or her used to a safety/breakaway collar (if desired), harness, leash, and grooming (bathing, nail clipping, and brushing fur and teeth) as early as possible. A microchip is a great idea and has helped fox owners I've known in the past. I also like collars with tags for instant identification purposes and so if the fox ever escapes, people will realize it's a pet. If you choose to take your fox for walks, you must get it used to this when it's a baby. Don't attempt to start taking an adult on walks for the first time. It is way too stressful and they can injure themselves. A harness is much more safe and secure than a collar for walks. Some people keep a collar on all the time, then put on the harness and remove the collar for comfort when walking. I keep an ID tag on both and the rabies tag on the harness since that is what is used in public. Please be aware that many dogs have a powerful instinct to attack foxes, so always use caution if walking your fox anywhere dogs might be. Never walk your fox off its leash no matter how well-trained. Foxes are not dogs and might run away without warning if scared or enticed by something. Walk your fox often! Foxes must be continually re-exposed to situations like this, otherwise they have a tendency to become fearful of it in a very short time. Your fox will love having toys to play with. Plushies, ropes, squeaky toys, baby rattles, dangling and spring cat toys, and similar things will give your fox something to do besides digging in the couch cushions and stealing your shoes. Just make sure to supervise play. To teach which items are acceptable to play with, you can smear a small amount of peanut butter on the toys and give praise for playing with them. Take away any items your fox is not supposed to have, but never hit or yell at him. I've had great success using a gentle spritz of water from a spray bottle when teaching the word "no" to foxes having a tough time with the concept. As a kit reaches its "teenage" years, around 6 months or so, it will go through a rebellious phase which can be difficult to handle. This will pass but you need to be patient and never hit or yell at him. 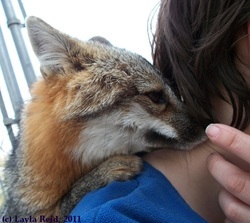 Foxes are not dogs and they do not inherently trust people. With a fox trust can be hard to gain but it's easy to lose. medical care I can't stress enough how important it is to find a vet who is not only willing to treat your fox but is also knowledgeable. 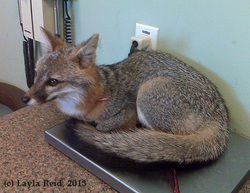 At the very least make sure your vet has connections with another vet that has had experience with foxes (such as a zoo veterinarian). This will usually work for basic care, but any major issues may see you driving a long ways to get treatment. 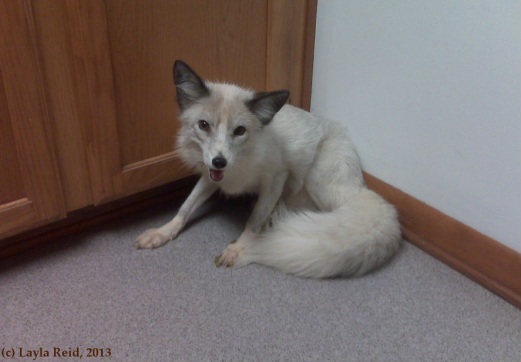 Make all of your connections before getting your fox and take him to visit his vet for hugs and treats fairly often so he'll remain familiar with them and not fearful. Foxes can also get heartworms. Use a monthly ivermectin based heartworm prevention year round to prevent infection. Do not start preventative treatment without your vet's permission. unknown dogs or places like pet stores and parks where infected dogs might have been. Some areas require you to have additional vaccinations by law. Other vaccines, such as distemper, may be given so long as the virus is killed or at least modified. This is one example of why a knowledgeable veterinarian is so important. Be aware that in many states, if your fox bites a person for any reason, they can legally euthanize and test for rabies whether its vaccinations are current or not. So please be careful and watchful if you allow your fox around other people. Keeping the vaccinations current and properly recorded with your vet will give you a better chance to fight for your fox's life if you should find yourself in that situation. It's highly recommended to spay or neuter your fox. This can lead to a healthier life, help cut down on undesirable behavior, and lessen their smell. Never keep two or more unaltered foxes together regardless of gender unless intending to breed them. Breeding is a remarkable amount of work which is why I didn't include that information here. If you are serious about investing the time and money into breeding foxes, contact me and I can discuss with you how to go about it. unattended with these kinds of animals. You should also be careful introducing any new pet into a house with an adult fox. It's not uncommon for some foxes to dislike another animal for no apparent reason. Foxes bond with each other for life. A mated pair is most common, but sometimes siblings, same-gender, and even another species of animal can cause a fox to form a very strong attachment. Removing one of them can lead to severe depression in your fox and he or she may even refuse to eat. You must earn a fox's affection and trust through patience, kindness, time, and consistency. You have to find a way to bond with them. Talk to them, mimic their sounds when they talk to you, and if safe to do so, handle them often. 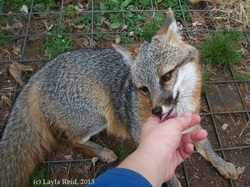 Not all foxes like to be petted or held no matter what you try. I know it's frustrating, but respect their personality and let them come to you. Don't force yourself on them. Remember, when you choose to bring a pet into your home it is a responsibility for the rest of that animal's life. This is even more important to think about with foxes. They will often bond with one person very strongly. Severing the bond can cause a fox to become very depressed and sometimes aggressive. For this reason it's often impossible to rehome a pet fox. If you no longer want your fox, he also cannot be released into the wild. It's illegal, he will not survive and also might be carrying illness that could drastically impact wild populations. So be sure you are ready to dedicate the time, money, and patience required before you decide to get a fox. Every species of fox has unique requirements in addition to general fox care. Please review the link below relating to the individual species you are considering. 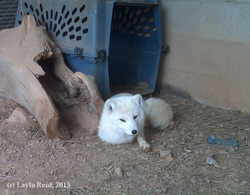 Red Fox includes all color variations such as white, marble, "arctic-marble", silver, etc. Most often if you have a pet fox other than a fennec, it falls into this category. Gray Fox this unique species is characterized by primarily salt and pepper hair. Most have red and white accents and a black stripe down the tail often ending in a black tip. misrepresented as, these stockier, small-eared cousins. Fennec Fox originally from Africa, the fennec is the tiniest of all fox species, featuring a beautiful golden coat and proportionately giant ears. Miscellaneous Foxes species not listed above that occasionally appear in the pet trade such as swifts, bat-eared, hybrid species, and Russian tame foxes. Do you still want a pet fox? So, you've done lots of research on care and temperament and are still considering a fox for a pet? Then the first step is to find out about the legality of keeping the particular species you want in the state, county, and town/city you live in. Some places require a permit or license, others don't, and in some areas pet foxes are illegal completely. The website Born Free USA has good information on state laws. You will also have to check your local (county and city) regulations because sometimes exotic pets, like foxes, are legal in your state and/or county but not the city. The next step is to make sure you can find a vet willing and able to treat a fox before you get one. Click here to access the Printer-Friendly version of this care sheet.